To all pregnant moms who want to have their babies at home, I get it. I truly do. You want a comfortable intimate environment to have what you deem is a “natural event” without “unnecessary intervention.” You want to be like the celebrities who have had successful home deliveries. But here’s the problem: your home is not equipped to deal with emergencies and they DO occur. Just ask celebrity mom Christine Turlington Burns, who experienced a postpartum hemorrhage and had to be rushed to the hospital in order to save her life. Obstetrics is a specialty of the unexpected. You MUST be prepared for emergencies. Fielding entered Johns Hopkins Hospital because the baby was “stuck.” The midwife couldn’t deliver the baby because it was either too large or she couldn’t manage a shoulder dystocia. According a blogger, Dr. Amy Tuteur, Midwife Evelyn Muhlhan’s license was suspended by the State of Maryland because of five homebirth disasters including Fielding’s delivery. An ambulance brought Fielding to a hospital where she allegedly waits for over 2 hours for blood test results. A c. section is delayed. A baby has brain damage. Take home message? Know your midwife’s professional record. Does she have malpractice suits? Has she been sanctioned by the state medical board for negligence? Meet your midwife’s ob-gyn back-up. The Smart Mother’s Guide to a Better Pregnancy discusses this in detail. At the first sign of trouble, Muhlhan should have contacted her ob backup. If she didn’t have one, she was begging for trouble. Have a PERSONAL copy of your prenatal chart with you and your back-up hospital or birthing center should have a copy as well. This is standard prenatal procedures. Having a homebirth doesn’t change that. Your prenatal record contains all of the important information including blood type and blood count. No one, I repeat NO ONE, is going to bring you into the operating room without knowing your blood type unless you are hemorrhaging to death. Had Fielding had a copy of her prenatal record, she might not have encountered the delay. 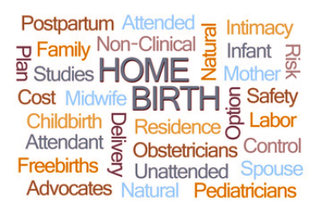 If you’re going to have a homebirth, then please take the necessary precautions. An ounce of prevention is always worth more than a pound of cure.